Please contact us with expedited shipping requests. Most items ship within one business day of order receipt! 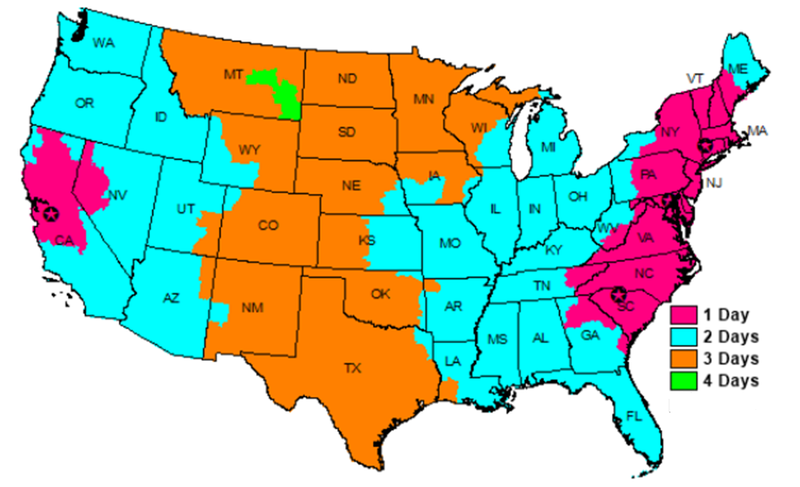 Most items ship the same or next business day FedEx ground or by LTL Freight with tracking info provided to you. We enter the email you provide us into the Fedex software; they forward tracking as it updates through their system. Please be sure check the spelling on the email address you provide us, it's the #1 reason customers do not get tracking. Tracking is automated and sometimes the email appears in a "junk' folder. Most orders ship Fedex Ground no signature required. This is most fence kits, multiple fence kits, rolls of fence and multiple rolls of fence. Some small orders ship USPS priority mail 1-3 day service. This is usually small items like Gripples, hardware, hogrings, hogringers, etc. Large orders ship freight (750+ pounds approximately) due to weight. This usually includes multiple large fence kits or multiple heavy rolls of fence depending on the size and weight. Customers may be required to be present for delivery and help unload their order, Most often the driver will move the pallets to the end of the truck with a pallet jack and customers unload the items from the pallets by hand. Most of these items can be unloaded piece by piece and are shipped to be hand unloaded. Sometimes the driver can lift the entire pallet off the truck and lower it to the ground if you purchase lift gate service. This may or may not work for your order at all depending on the size of what you're ordering. If what your ordering is not for self-installation & someone is installing the fence for you, one option is to ship it to them or have their name and contact number entered for delivery. Freight companies are required to call residential deliveries first for an appointment and will give you a delivery window. You can call them first (with tracking information) to make this appointment, or wait for them to contact you once the freight reaches the local terminal closest to you. Damaged freight: Not often, maybe 1 in 200 deliveries have some damage in transit. We package and strap our outgoing materials in the best possible way. Please Inspect your freight upon delivery for any damage. if your shipment is damaged note the damage on the paperwork they ask you to sign and state "packing damaged subject to inspection". This will allow you to inspect what you have received; if there is any damage, we can re-ship what's missing and make a claim with the freight carrier. Damage must be reported to us within 5 business days. Unused / unopened materials can be returned for a refund with a RMA number within 30 days from purchase date. A RMA number is what we use to identify the return coming back into the warehouse. Write the RMA number on the box or boxes to be returned or enter it on the return labels attached to each box. We suggest using a shipping carrier that provides tracking information, providing you proof that your return was received by us. All returns must be received in unused and undamaged condition to the point where we can re-sell them to another customer. Please package returns carefully. Items are shipped to you packaged for transit in one direction. You may need to reinforce or completely re-package items for return. Rolls of fence that have been unrolled, then rolled back up again are not returnable. Fence rolls are machine spooled tightly for shipping. When they are hand rolled back up we are not able to sell them to another customer as new. Shipping costs are not refundable (our cost to ship product to you as well as for you to return product to us). Please be sure to order only what you need. It's very expensive to ship large and heavy items. Cancellations and returns are subject to a 10% restocking fee. This covers our cost to process your order, package it and ship it including credit card fees. This applies the instant you place your order. Orders that are refused (if Fedex or the freight company shows up to deliver, or calls you for an appointment and you state you don't want the delivery) will ship back to us and the shipping company will charge us for returning the delivery. This shipping cost (our cost to ship to you, the cost to return the delivery to us) is not refundable. Note: Not all warehouses stock and ship all fence materials and products. Please contact us if you need product by a specific date. All pickups must be arranged in advance (no walk-ins). Thank you!